The Washington Monument reopened this week and is ready for the summer tourist season! The monument was closed in 2011 after it was damaged in a rare earthquake. For the last three years the monument has undergone an extensive restoration as some of the mortar and marble was shaken loose during the earthquake. 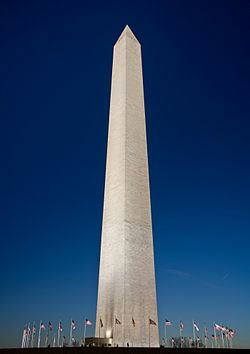 The Washington Monument is a 555 foot tower on the National Mall and it offers some of the best views of Washington, DC. There is an elevator to reach the top which makes it a family friendly activity. Click here for more information on securing tickets and summer hours for the monument. To celebrate the reopening of the Washington Monument The Trust for the National Mall and Destination DC have partnered to launch a contest called A Monumental First. Go to www.Monumental4th.org for a chance to win a three-day trip to Washington, D.C. for the Fourth of July!